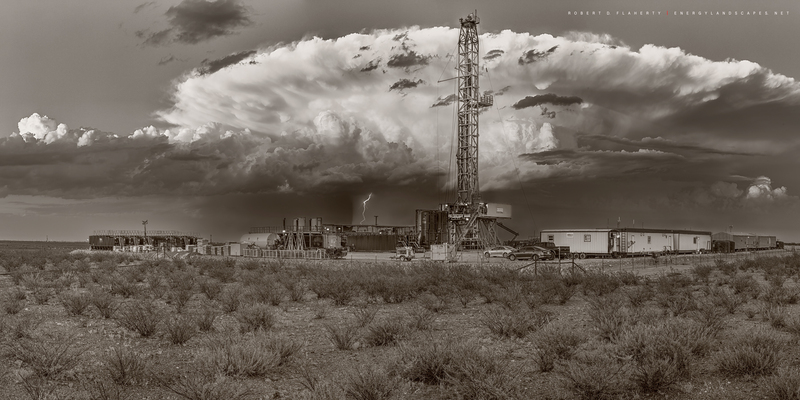 Beneath A Broken Sky is a high resolution 2:1 panorama featuring Precision Drilling Corp. rig 555 on a lateral location Northeast of Ft. Stockton Texas. An early Spring servere thunderstorm and lightning provide the backdrop for the image. The panorama is produced in sepia toned black & white. Seven different light levels were blended together to hold back the brightness of the clouds while pulling up darker details in the foreground and subject areas. The image was originally commissioned by Contango Oil & Gas in April 2019.